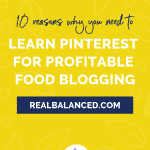 If you want to be a profitable food blogger, you MUST use Pinterest. Here are 10 reasons why this platform is SO beneficial for successful food blogging! If you want to be a successful food blogger with a profitable business, you NEED to utilize Pinterest. A great way to drive traffic to your website and increase revenue, incorporating Pinterest strategy into your business plan is essential. Implementing a great Pinterest marketing strategy isn’t as complicated as you may think. It does require time aimed at learning the utility of the platform, but, trust me, the payoff is worth it! 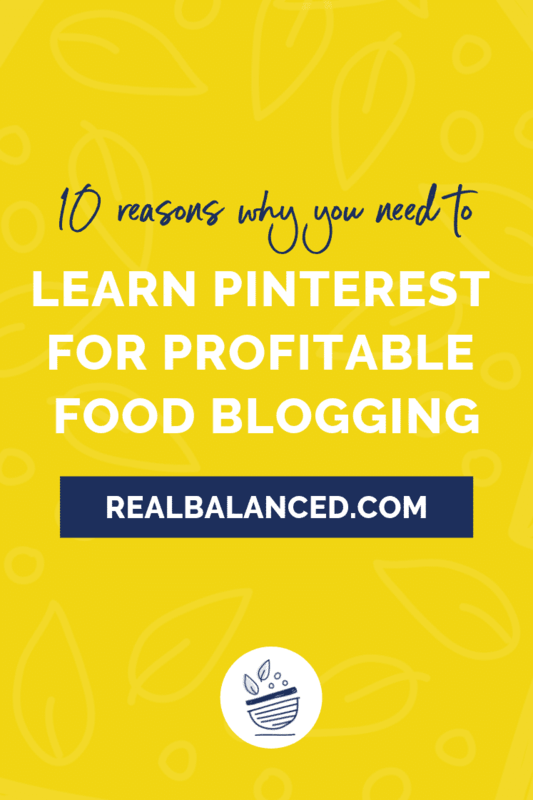 Here are 10 reasons why I encourage you to learn Pinterest for profitable food blogging. Let’s start with the basics. Pinterest is a HUGE source of opportunity. There are more than 150 million annual users. 150 MILLION! That is A LOT of people and this, essentially, makes the possibilities for traffic to your site exponential. From those 150 million users, there are sure to be a large chunk of people that fall into the food-lovin’ niche that you are a part of. Still not convinced? Well, food and cooking are the two most popular categories on the platform! So, if you’re a food blogger, you NEED to be pinning and re-pinning your recipes (and other people’s recipes, too!) if you want to grow your food blog. Remember those 150 million users that I just mentioned? Pinterest helps you turn them into traffic. If someone has never heard of your site before, Pinterest can serve as the “stepping stone” to discovering your content and, if you have lead magnets available on your site (which you should!! ), making that visitor a lifelong fan! Pinterest is essentially a traffic magnet. When someone comes onto the platform and searches for a recipe, they have to go to the host website to actually get the full recipe. This means that when you pin something, if someone wants to learn more, they need to click the Pinterest image (commonly referred to as a “pin”) and they’re taken to your site. SEO is important here. Just like you optimize your website SEO content, you need to optimize your pins. This means you should pay special attention to the titles and keywords. If you don’t use a title, people cannot find your image. If they can’t find your image, they can’t find your site. Better Pinterest SEO = better Pinterest reach = website traffic. The purpose of Pinterest is to save content to your boards. When you do, others can see what you have saved and are able to also save that same content. This allows pins to be shared from user to user in a chain-like fashion. What does this mean for you? This means that each time someone saves your pin, all of their followers will see it. From that, some of their followers may choose to save the pin as well. As this goes on, your pin begins to snowball. Saves increase and your reach gets more and more expansive. Long story short, Pinterest allows your content to be easily and quickly viewed by lots of people. I don’t know about you, but I love Pinterest so much that I often use it as a search engine. I know that if I want to find ideas for something, whether it be food related or not, I can open up Pinterest and be presented with a variety of ideas instantly. The trend of using Pinterest as a search engine is becoming more and more popular. Pinterest is a hub for creative ideas and is, thus, becoming a “go-to” search engine when people need answers or inspiration. It is used for finding recipes, home decorating tips, fashion inspiration, shopping, workout routines, and more. For many people, the purpose of using Pinterest is more than searching and saving just pretty images; it actually serves as a more creatively-driven, image-focused form of Google! People like eye-catching images, beautiful photography, and to quickly see the final result of a project (in this case, a final shot of a recipe). If they are looking for new recipes to try, this is definitely the case. Picture this: you’re presented with two recipes of keto lasagna. One features the most beautiful, mouth watering images, and the other is all text. Which version of the recipe are you going to try to make? If you guessed the pin with the image of the tasty keto lasagna, you’re exactly right. People want to see what the food is going to look like. Bonus points if the food photography is especially drool-worthy! People love imagery, so providing great pins with zesty, delicious looking images is key! Automating your Pinterest posts is SO fast and easy. My go-to automation tool is Tailwind. It’s simple to use and an extremely powerful form of automation. I love automating my Pinterest posts because I am able to sit down and schedule everything all in one session. This saves me a TON of time later on because I do not have to log in and individually pin content each time I want to post! If you are a part of Tailwind, consider joining a Tailwind Tribe! These tribes connect different accounts with similar content. You are able to see content similar to yours in one place, and this allows you to find great content to share quite quickly and easily. When you share other bloggers’ content, you are helping them by exposing them to your readers. In return, they share your content with their readers, and the same benefits take place. 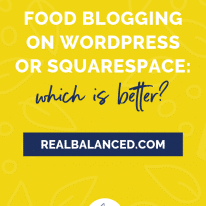 Check out more of my tips on the benefits of automating your food blog! Advertising on Pinterest is easy and, when done properly, can result in rapid ROI (“return on investment”). I recommend promoting pins to all bloggers who are active on the platform because it’s a sure-fire way to increase your content’s reach and bring in additional traffic. Pinterest promotes a simple, 4-step approach to setting up Promoted Pins (ads): Choose your pin, choose your target audience, choose what type of ad you wish to pay for, and track your progress. To ensure you set your promoted pin up properly, if you can afford it, I’d recommend hiring someone who is an expert at Pinterest advertising as they will know how to best target your ideal audience. If you are looking to build your email list, Pinterest is a wonderful way to do so! Think about how you are currently attracting email sign ups. Are you using a freebie? Perhaps you have put together a free eBook or other useful resource. Whatever it may be, Pinterest can help you share that with your audience. Create a pin that showcases your free resource, and link it to your lead page! When you do, readers will simply click the pin to access the resource, and Pinterest will redirect them to the lead page. They will input their email to get the freebie, and ta-da! You’ve gained a subscriber. Want to see this in action? Take a look at this pin here. Pinterest is AWESOME for this, especially because readers feel confident that you’ve provided them with an exciting resource full of awesome value, which you HAVE! Choose this as one of your paid pins and you can really use it to your advantage to expand your reach. Like with many other social media outlets, Pinterest allows you to leave comments. Readers often leave comments on food pins that touch on the tastiness of the recipe, whether it was easy to make, or if they used any substitutions to make it complaint with their lifestyle. Guess what. This is an amazing source of reviews and free advertising, and it is all right there for pinners to see! With enough rave reviews talking about how tasty your awesome recipe was, you will surely be able to snag a bit of extra traffic! Sure, at Real Balanced all of my recipes are keto and nut-free. But, what about my recipes that are keto, nut-free AND vegan? With Pinterest, I can create a vegan-specific board in order to provide a resource for all vegan pinners! Boards allow you to break down your content into sub categories. You should DEFINITELY incorporate topic-specific boards into your Pinterest strategy!